This series of videos is devoted specifically to Jehovah’s Witnesses who have or are waking up to the true nature of JW.org. When your life is all planned out for you and your salvation is assured based on membership in and obedience to an organization, it is extremely distressing to be suddenly “out on the street” as it were. For some, the motivation to leave the organization comes from a love of truth. [i] Sitting in a meeting listening to falsehoods being expounded from the platform grates on the soul to the point that you can no longer stand it and have to get out. Whatever the cause, the benefit for many has been the freedom that comes from knowing the truth. Just as Jesus promised, the truth has set us free. So, it seems such a tragedy that having gained freedom, some again succumb to enslavement to men. Scanning the internet leads to the inevitable conclusion that the majority of those leaving the Organization of Jehovah’s Witnesses turn to agnosticism and atheism. Then there are others who fall prey to the many conspiracy theorists out there spouting all manner of zany ideas. The question that must be asked is, ‘Have the majority of people lost the power of critical thought?’ We’re not just talking with regard to religion, but rather there seems to be a willingness in all walks of life—politics, economics, science, you name it—to simply surrender one’s thinking ability up to others whom we may consider more knowledgeable or more intelligent or more powerful than ourselves. This is understandable, though not excusable, because we are kept so busy just making ends meet that we feel we lack the time and inclination to properly examine whether what someone is preaching and teaching is fact or fiction. But can we really afford to do this? The apostle John tells us that “the whole world is lying in the power of the wicked one”. (1 John 5:19) Jesus calls Satan the father of the lie and the original manslayer. (John 8:42-44 NTW Reference Bible) It follows that lies and deception would be the standard modus operandi of today’s world. It appears that for many, having been set free from enslavement to the men governing the Organization of Jehovah’s Witnesses, they then fall prey to modern “philosophies and empty deceptions” and again become “captives of a concept”. Your only protection is your own ability to think critically. You can still trust people, but only after you have verified that they are trustworthy, and even then, your trust must have limits. “Trust but verify” must be our mantra. You may trust me to a degree—and I’ll do what I can to earn that trust—but never give up your power of critical thinking and never again follow men. Follow only the Christ. However, both atheists and agnostics are left with a problem: How to explain the existence of life, the universe, and everything. For this, many turn to evolution. Now, for the sake of some, I should state that there are a minority of believers in evolution that accept what you might call creationist evolution which is the belief that certain processes believed to be evolutionary are the result of creation by a superior intelligence. However, this is not the premise upon which the evolutionary theory is built, not taught in educational institutions, nor supported in scientific journals. That theory concerns itself with explaining the process by which the “established fact” of evolution works itself out. What scientists that support evolution teach is that life, the universe, and everything, came about by chance, not by some overriding intelligence. It is that fundamental difference that will be the subject of this discussion. I will be upfront with you. I don’t believe in evolution at all. I do believe in God. However, my beliefs do not matter. I could be wrong. It is only by examining the evidence and evaluating my conclusions that you will be able to determine if you agree with me, or instead, side with those believing in evolution. The first thing you need to evaluate when listening to anyone is what motivates them. Are they motivated by a desire to know truth, to follow the evidence wherever it may lead even if the destination may not be desirable at first? It is not always easy to understand the motivation of another, but if it is other than a love of truth, one must exercise great caution. Traditionally, there are two sides to the argument concerning the origin of all things: Evolution vs. Creationism. One would expect an argument like this to be based on science. Getting into questions of religious interpretation would only muddy the waters and offer no solid basis of proof. Yet, that is exactly where both men went with their arguments, and quite willingly I might add. The reason, I believe, for this was revealed by the atheist, Mr. Hitchens, in a splendid little gem of unsolicited honesty at the 1:24 minute mark. And there it is! There is the key to the whole question, and the reason that religionists and evolutionists attack this issue with such fervour and zeal. To a religious leader, the existence of God means he has the right to tell other people what to do with their lives. To the evolutionist, the existence of God empowers religion to have a significant role in how our society is controlled. Both are wrong. The existence of God does not empower men to rule over other men. What is my motivation in telling you all this? I make no money from it, and I seek no followers. In fact, I reject the whole idea and would consider that were men to follow me, I would be a failure. I seek only followers of Jesus—and for myself, his favor. Believe that if you will, or doubt it. Whatever the case, look at the evidence presented. The word, “science”, comes from Latin scientia, from scire “to know”. Science is the pursuit of knowledge and we should all be scientists, i.e., knowledge seekers. The sure way to block the discovery of scientific fact is to enter the search with the idea that you already have a fundamental truth which only needs proving. A hypothesis is one thing. All that means is that we are starting with a reasonable assumption and then going on a search for evidence to either support or dismiss it—giving equal weight to either possibility. However, neither creationists nor evolutionists approach their field of investigation hypothetically. Creationists already “know” that the earth was created in six literal 24-hour days. They are just looking for evidence to prove that “fact”. Likewise, evolutionists “know” that evolution is a fact. When they speak of the theory of evolution, they are referring to the process by which it comes about. Our concern here is not to change the minds of those within either the creationist nor the evolutionist communities. Our concern is to protect those awakening from decades of thought-controlling doctrine who may be prone to falling for the same trick again, but under a new guise. Let us not trust what strangers tell us, but instead, let us “make sure of all things.” Let us engage our power of critical thought. Thus, we will enter this discussion with an open mind; no preconceived knowledge nor bias; and let the evidence take us where it will. This is not going to be a Bible discussion. The Bible is irrelevant at this stage, since the entirety of its message depends on what we have yet to prove exists. The Bible cannot be the Word of God if there is no God, and trying to use it to prove God exists is the very definition of circular logic. Likewise, all religion, Christian and otherwise, has no place in this analysis. No God…no religion. It should be noted, however, that proving God’s existence doesn’t automatically validate that any particular book men consider as sacred is of divine origin. Nor does the mere existence of God legitimize any religion. We would be getting ahead of ourselves if we try to factor such questions into our analysis of the existing evidence. Since we are dismissing all religion and religious writings from the discussion, let us also refrain from using the title “God”. Its association with religion, however unwarranted and unwelcome in my opinion, may create an unwanted bias that we can well do without. We are trying to establish whether life, the universe, and everything came about by design or by chance. That’s it. The ‘how’ does not concern us here, but only the ‘what’. How are we going to prove whether the universe came about by design or by chance? Let us use the science that is employed to define all aspects of the universe – mathematics. Probability theory is a branch of mathematics that deals with quantities having random distributions. Let’s look at it to examine a vital element for life, the protein. We’ve all heard of proteins, but the average person—and I’m including myself in that number—doesn’t really know what they are. Proteins are made up of amino acids. And no, I don’t really know what an amino acid is either, only that they are complex molecules. Yes, I do know what a molecule is, but if you’re not sure, let’s simplify the whole thing by saying an amino acid is like a letter of the alphabet. If you combine letters the right way, you get meaningful words; the wrong way and you get gibberish. That’s a 2 with 135 zeroes after it. To put that into perspective, the number of atoms in the entire observable universe has been calculated to be 1080 or a 10 with 80 zeroes after it, falling short by 55 zeroes. Now bear in mind that Cytochrome C is a small protein. There is a large protein called titin which is a component of muscle and it comes in at between 25,000 to 30,000 amino acids. Imagine a word made up of 30,000 letters occurring by chance. Understanding the odds presented here is beyond the comprehension of most of us, so let’s reduce it down to something simpler. What if I were to tell you that I held two tickets to yesterday’s lottery and I wanted to give you one of them, but you had to choose. One was a winner and the other a losing ticket. I then said that the one in my right hand was 99% likely to be the winner, while the one in my left hand was only 1% likely to be the winner. Which ticket would you choose? This is how scientific discovery works. When we can’t know for sure, we have to go with the probability. A probably that something is 99% true is very compelling. A probability of 99.9999999% is overwhelming compelling. So why would a scientist go with the least probable option? What would motivate him to take such a course of action? For the evolutionist to insist against such beyond astronomical odds that the universe came about by chance should make us question his motivation. A scientist should never try to make the evidence fit a conclusion, but rather, he should follow the evidence to its most likely conclusion. Now, evolutionists might suggest that the precise order of amino acids in a protein is very, very flexible and that there are many different viable combinations. It’s like saying that there’s a much better chance of winning a lottery if, instead of one winning number, there are hundreds of thousands of winning numbers. That was the hope when molecular biology was in its infancy—following the discovery of DNA. However, today we’ve come to see that is not the case. The sequences are very fixed and invariable, and there is a marked absence of the type of transitional proteins what would be expected were species evolving from one to another. Nevertheless, died-in-the-wool evolutionists will insist that as unlikely as these chance combinations are, there is a possibility that given enough time, they are inevitable. You may have a better chance of getting struck by lightning than of winning the lottery, but hey, somebody does end up winning the lottery, and some get struck by lightening. 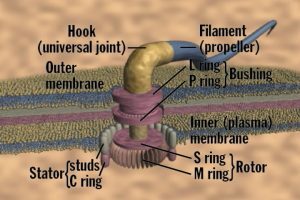 This is a diagram of a bacterial flagellum. It looks like a motor with a propeller attached and that is exactly what it is: a biological motor. It has a stator, a rotor, bushings, a hook and a propeller. Cells use it to move around. Now we recognize that there are different ways that a cell can propel itself. Sperm cells come to mind. However, any engineer will tell you that the alternatives for a viable propulsion system are quite finite. Instead of a brass propeller on my outboard motor, try using rotating flowerpots and see how far you get. What are the possibilities that this little beastie arose by chance? I can’t do the math, but those who can say 1 in 2234. The number of times you’d have to try would be a 2 followed by 234 zeros. Is it conceivable, let alone inevitable, that given enough time, such a device could occur by chance? Let’s see. There is something called the Planck constant which is a measure of the fastest time in which matter can transition from one state to another. It is 10-45 of a second. We’ve already discussed that the total number of atoms in the observable universe is a 1080 and if we go with the most liberal estimates for the age of the universe expressed in seconds, we get 1025. So, let’s say that every atom in the universe (1080) is devoted to the sole task of evolving the bacterial flagellum, and that every atom is working at this task at the fastest possible speed allowed by physics (10-45 seconds) and that these atoms have been working at this since the literal beginning of time (1025 seconds). Just how many chances have they had to accomplish this one task? 1080 X 1045 X 1025 gives us 10150. If we missed it by only one zero, we’d need 10 universes to make it. If we missed by 3 zeros, we’d need a thousand universes to make it, but we are short by over 80 zeroes. There isn’t even a word in the English language to express a number of that magnitude. If evolution can’t be shown to produce a relatively simple structure by chance, what about DNA which is billions of elements in length? So far, we’ve discussed math and probabilities, but there’s another element that we should consider. In the movie, Contact, based on the book by the same name by renowned evolutionist, Carl Sagan, the lead character, Dr. Ellie Arroway, played by Jodie Foster, detects a series of radio pulses from the star system Vega. These pulses come in a pattern that counts out prime numbers – numbers divisible only by one and themselves, such as 1, 2, 3, 5, 7, 11, 13, and so on. The scientists all recognize this as an indication of intelligent life, communicating using the universal language of math. It takes an intelligence to recognize an intelligence. If you land on Mars with your cat and you find scrawled on the ground in front of you the words, “Welcome to Mars. I hope you brought beer.” Your cat will have no idea that you’ve just found evidence of intelligent life, but you will. I have been programming computers since before there was an IBM PC. There are two things I can state with certainty. 1) A computer program is the result of intelligence not random chance. 2) Program code is useless without a computer on which to run it. DNA is program code. Like a computer program, it is useless by itself. Only within the confines of a cell can the programming code of DNA do its work. Comparing even the most complex of human computer programs to DNA is like comparing a candle to the sun. Nevertheless, the analogy serves to emphasize that what we see in DNA—what our intelligence recognizes—is design. We recognize another intelligence. DNA will take a cell and cause it to reproduce itself and then through a mechanism we are barely starting to understand, tell some cells to turn themselves into bone, others to muscle, or a heart, or liver, or an eye, an ear, or a brain; and it will tell them when to stop. This microscopic strand of code contains not only the programming to assemble the matter making up the human body, but also instructions that give us the capacity to love, laugh, and rejoice—not to mention the human conscience. All programmed in there. There truly are no words to express how marvelous it is. If you wish to conclude after all this that there is no designer, no universal intelligence, then go right ahead. That is what free will is all about. Of course, having the right to free will doesn’t grant any of us freedom from the consequences. The scope of this video’s audience, as I stated at the start, is pretty restrictive. We are dealing with people who have always believed in God, but may have lost their faith in the divine due to the hypocrisy of men. If we have helped some to regain that, so much the better. There still may be lingering doubts. Where is God? Why doesn’t he help us? Why do we still die? Is there any hope for the future? Does God love us? If so, why does he permit injustice and suffering? Why did he order genocide in the past? Valid questions, all. I’d like to take a stab at them all, given time. But at least we have a starting point. Somebody made us. Now we can start searching for him. [i] The failed overlapping generation doctrine, the baseless 1914 teaching, or the false teaching that the other sheep of John 10:16 represent a distinct class of Christian who are not the children of God. [ii] While praising the brothers and sisters in Malawi for enduring unspeakable persecution rather than compromise their integrity by purchasing a membership card in the reigning political party, the Governing Body authorized a 10-year affiliation in support of the Wild Beast of Revelation, the United Nations Organization. [iii] Australia Royal Commission into Institutional Responses to Child Sexual Abuse. Meliti, thanks for tackling the subject. DNA must be one of the greatest lines of evidence of a Creator. As for all the numbers, Who on earth ever decided those probability figures. There are lies, damned lies, and Statistics. People can use statistics to prove anything they want. However to use those numbers to show the chance to some sort of life starting still does not explain how it can produce the wonderful variety of life which exists, nor does it explain how so much of it appears to arrive at the same period of time. Is there not a point at which the probability of something is so small, that there just is no probability of it ever happening ? I thought that is what your use of numbers seems to say, in which case its just the long way round of saying the same thing – Evolution the way it is usually explained – no chance. This is a much-needed article/video. I have seen too many ex JWs go down the route of becoming atheists or agnostics. They accept evolution as correct because they have heard “authority figures” say so. The challenge for many is that in the previous JW world they had not developed their critical thinking faculties to any level of maturity. This issue is still there when they accept that evolution is correct because there has been no critical evaluation of the information. I thought this was a very good start in addressing this problem. A further piece of work that is required is to separate micro and macroevolution. This causes a great deal of confusion in the discussion. Micro-evolution has never been disputed only macro. In fact, there is NO evidence for Along with this point, natural selection can never add information and hence has no creative power. In addition, when the term “Big Bang was coined by Fred Hoyle, it was used in a derisory manner as they could not accept that there was a beginning. Unfortunately, this term has stuck and gives people the idea that it was a random and chance act by using this term. Finally, the theory of evolution is really underpinned by a philosophical approach of naturalistic materialism and any of the so-called theistic evolutionary ideas miss the mark. There can be no compromise unless there is clear evidence on the matter. Macro-evolution and theistic evolution do not provide any evidence in my humble opinion. Flipping a coin will never establish if God exists or not, neither will an astronomical amount of zeros. Just look at our Earth and what it contains, if you don’t see God’s evolving creation, then perhaps you should make an appointment with the eye Doctor. Evolution is Satan’s little creation, backed up by a bunch of “people” that believe that he is “brighter” than God. It’s the same old story, Satan thought he was better than God and the ones that believe him think they are better than God. leave them be to decide what is true, The Lord Jesus Christ takes care of his own and the devil takes care of his own, that’s just part of the evolving creation. You can lead a created horse to created water but you can’t make him drink it. I believe that you are right about some things and seriously wrong about others. I think you’re not allowing for another possibility – that good programming could incorporate random chance. You’ve made it an either/or situation when it’s not. This point may not be clear to people who don’t have an interest in programming or mathematics. But I’ll try to demonstrate it in the simplest way I can. Let’s start with the simple coin toss. A single flip of the coin is a random event and we cannot predict the outcome except to say it will be either heads or tails. Do 1000 coin tosses though and we can get close to predicting a 50/50 outcome for the series as a whole (approximately half will be heads and half will be tails). Do a million and we get closer still. As we approach ever larger numbers the overall outcome is entirely predictable that we will close in on that exact 50/50 ratio. The number of variables in the coin toss are very small. But in ANY stochastic system – while you can never predict the exact results – you can forecast the probability that certain sequences will show up. As a next step to coin tosses I recommend consideration of “Plinko Probability”. I encourage people to Google that one, otherwise this post will get too long. As we move to ever more complex systems the variables go up exponentially, but the same principals can be applied. And with a creator of infinite capacity there is no reason to think that there is a breaking-point to these models. Does it not seem that ordered randomness is not at the heart of quantum physics? Should we assault a scientific furtherance of our human understanding in this area on the basis that “God does not play dice”? How shortsighted that would be. God does indeed play dice in the most amazing ways, and I personally believe that his dice-playing enables our free-will. After all how would you or I have gone about creating creatures of free-will? These issues are now confronting us as we enter the era of AI and we can see how the work of Jehovah God is still so far removed from anything we could achieve. Just as “atheism” must be separated from “evolution” (even though for some people one will influence the other), theories around “abiogenesis” must be separated from “natural selection”. This article fails to do that, falling into the trap of lumping things together in such a way that false dichotomies can arise. I’m not claiming that they are unrelated topics. For sure there is a strong connection between the way evolution is taught in the educational system and the agenda of the atheist community. I agree with you 100% about that. But just as it may be true that most murderers are males, and yet that doesn’t make murder a distinctly gender based issue, it may be true that most evolutionists are atheist and yet that says little about the topic at hand. Abiogenesis is a separate consideration to natural selection. Many creationists and evolutionists will inappropriately tie these together. But if a person is unable to separate the issues then an artificial problem can arise. If you push the tenet that evolution and God are totally incompatible, and people buy into it, then they are forced to pick a side. It’s a mistake because anyone who looks hard at the evidence for natural selection will surely find that it’s extremely well supported by multiple distinct lines of evidence and reasoning (surely we know that young-earth creationists who claim that dinosaurs bones are simply a test of some sort are using flawed reasoning). And so now maybe you’ve forced them to pick the wrong “side”. A false dichotomy has been created which leads to stumbling people away from God. If however, a person gains an appreciation for the incredibly beautiful and elegant programming that God put in place – not only for the existence of everything living, but in its ability to adapt to changing variables – for sincere and people it will only result in an enhanced appreciation of our creator. Let me ask this – in your model how do you interpret the action of a spider wasp that lays it’s eggs inside of a live prey they it paralyzes so that the animal can be eaten alive? Maybe you shrug it off as these being non-sentient creatures that feel no pain somehow. Most reasoning God-believing people are bothered by such things because they naturally recognize that there seems to be a disparity between the God who takes notice when a sparrow falls to the ground, and what is actually observable in the real world. Did God hand-craft such behaviour – or is it possible that if an Edenic existence were to have continued from Adam being imbued with God’s spirit and reflecting his person, then we would nurture the environments in such a way that natural selection would eventually work in a different direction? Just as we have to clear away thorns and thistles to create the garden, God gave us this awesome opportunity to appreciate how nature itself works and to steer its course. Telling your audience categorically that evolution is incompatible with God is a serious mistake. You will win over those who want to hear these words and you will lose those who do their due diligence on the evidence. And that’s tragic because there is no reason for conflict. We need to help people to carefully pick apart the issues – not show them how to create strawmen. Thank you for sharing this point of view. I respect that. Dear appolosOfAlexandria, I followed your line of reasoning for the rebuttal of Eric’s presentation but my reasons for objection are as follows. You then say; I think you’re not allowing for another possibility – that good programming could incorporate random chance. You’ve made it an either/or situation when it’s not. In defence of random chance being responsible for life forms the way they are on Earth, the argument is often presented that the “Universe” given the chance and the time to “roll the dice” or ”flip the coin” enough times then something like “good programming” could be seen to emerge. Although this seems to be a contradiction in terms to begin with, because random chance and intelligent programing have as a basis two different sources. One, just random chance, and the other, a guided intelligence. You or the authors of this theory are guilty of a fallacy called equivocation. This is where ordinary language or words are changed to have a different meaning that is used in everyday use to bolster the argument. For example instead of using the term “intelligent programming or design”, the theorist’s side step the obvious by changing the word or term to say “good programming” without explaining or defining the term. One that obviously would end up being intelligent programming which would end up being a self-defeating argument that “good/intelligent programming “ came about in a random way and as a result of chance and not by a guided source that is intelligent, and yep “good” to be sure! The fallacy of equivocation occurs when a key term or phrase in an argument is used in an ambiguous way, with one meaning in one portion of the argument and then another meaning in another portion of the argument. You use the scenario of ad-infinitum flips to produce the “good programing” which is responsible for life. It is well attested by scientists of all persuasions whether they believe in a God creator, are Atheists or think life is from aliens from some distant time in the past who “seeded” life on Earth which developed to what we see today. (Something the famous naturalist Richard Dawkins espouses) In all cases it is a shutdown case that the numbers or “chances for life to come about in the simplest form such as for a start, a protein molecule let alone the number of different proteins arranged in a special and vital pattern to form the complex and different life forms is astronomical to the point of improbability! Yet many scientists resistant to the idea of a guided intelligence still hold to the premise that life got here by chance. So let me run a little experiment for you so you can become a little more familiar with the kind of numbers we are talking about when you say that “flipping the coin” enough times can achieve the results we see in nature, “good programing”. In this case I will not use astronomical figures to start with but only a moderate number we can imagine. Let’s say flip straight heads on a coin only 100 times before a tails. What do you think the chances of doing this is without a guided influence? Does it seem probable to you? Atheist’s desperate for a compelling argument; use a form of this one. Although they admit that the number of consecutive heads required to be flipped is in the order of astronomical numbers that Eric was quoting above, but let’s just play with the number 100 for now. The numbers may astonish you but to toss consecutive heads for only a 100 times is 2 to the 100th power! Or 1.2676506 x 10 to the power of 30! This means in practical terms that to toss 100 consecutive heads or tails is 1 chance in 1,267,650,600,000,000,000,000,000,000,000. This former figure is the possible outcomes for each toss of the coin until you tossed 100 consecutive heads or tails! My point is you have presented another fallacy. The coin fallacy! It is not a case of a 50/50 as you put it simply. The probabilities are astronomical as in the numbers in Eric presentation for life coming about by chance and they cannot be side stepped easily. This is not to mention the hostile and unfriendly environment that all of this chance / random “good programming” is supposed to have quietly taken place! Also Abio-genesis is a fancy term that basically means life from non-living stuff. The question is where did the nonliving stuff come from anyway??? Here we go! Another coin toss scenario that only adds to the figures! You also talk about quantum physics too. How in the world could you use this as support of “good programming” too is beyond me? The simple fact is that quantum physics is about space and matter at a sub atomic level. A level that scientists are not yet sure of even exists, and are sill theorising as to whether it exists or what it is! You just throw this in as part of the argument although you do not elaborate how it supports your argument except to wildly assert as you do soon after by saying the following. You then further make assertions around natural selection as being attested to by hard evidence by saying the following below; (without offering any evidence or where it can be sourced) the very purpose of this series if I understand it correctly is to challenge the ideas you present as not having any foundation against what is empirically available and is scientifically observed to date along with the extrinsic available evidence by reputable scientists of all persuasions! You say; It’s a mistake because anyone who looks hard at the evidence for natural selection will surely find that it’s extremely well supported by multiple distinct lines of evidence and reasoning (surely we know that young-earth creationists who claim that dinosaurs bones are simply a test of some sort are using flawed reasoning). And so now maybe you’ve forced them to pick the wrong “side”. A false dichotomy has been created which leads to stumbling people away from God. You then point of the spider wasp lunching on live prey as further proof of you position! This is not about chance, this is another argument you present, not something in the presentation we are discussing and could also be dealt with another time but does not validate your other argument one bit. I eat stuff like fish and lobster that was alive relatively moments ago and that does not disprove my existence or the fact that I am wonderfully made by design. Is this what you are talking about when you talk about the straw man fallacy? Using emotionalism when the argument is around hard facts? You said; Let me ask this – in your model how do you interpret the action of a spider wasp that lays its eggs inside of a live prey they it paralyses’ so that the animal can be eaten alive? Maybe you shrug it off as these being non-sentient creatures that feel no pain somehow. Most reasoning God-believing people are bothered by such things because they naturally recognize that there seems to be a disparity between the God who takes notice when a sparrow falls to the ground, and what is actually observable in the real world. Did God hand-craft such. And that’s tragic because there is no reason for conflict. We need to help people to carefully pick apart the issues – not show them how to create strawmen. Appolos the status quo for a considerable time is that the theory of Evolution of life has been unassailable for a long time. However there is information that is now available that completely slays this idea and the most reasonable explanation for life on Earth, indeed the very existence of the universe is as a result of intelligent design and not due to some random processes. And as you say the discussion can be lengthy but I think I have made my point at least around your objection and the coin flip chance argument. You are using old and disproven theories and flawed arguments that have been generally abandoned for some time in the discussion around how the Universe and the life on earth came about. Have a nice day all. Looking forward to more from any one on this subject. You misunderstand me on many levels, and that is to be expected. I’ve preached your message from the pulpit. I’ve studied it extensively. At the heart of this lies the assertion that someone who accepts the evidence for “natural selection” believes in “random unguided chance” as you put it. I believe in the evidence for natural selection, but I don’t believe that everything is here by means of “random unguided chance”. Unless we can agree that there is no logical fallacy on this specific point then we have nothing to base a discussion on. I do fully understand how people don’t get it because I was in that place myself at one time. Life did NOT come about by random unguided chance. The variety of life we see today did NOT come about by random unguided chance. Do you understand that I believe these things fully? You misunderstood my reasoning on the coin toss and the spider wasp. I didn’t offer evidence for NS because my intent here is not to sell the idea of NS. It’s simply to let people know that if they have considered the evidence fully, and like me have come to a conclusion that NS is difficult to dispute, then it does NOT automatically lead to an atheist position. And in the case of some like me it can enhance our appreciation for the creator. That’s all. Hi Apollos, thank you for sharing this view. You have explained in a very nice manner. I also believe that our creator provided the building blocks so that we can develop but also influence. Play with the variables and create different outcomes. Some nice some less but we can learn. It is like “mixing” two dog species to ‘”create” a third species / type of dog. Playing with variables in a program to generate another outcome. It allows for humans to learn, use their skills, their free will. It makes life therefore very interesting as the outcome is not always fixed. To Brother Appolos and the points you made after mine. I think we are on a different page as you say. My point is that your arguments around natural selection and random mutations do not explain how life came about in the first instance. Natural selection is an idea based on already preexisting life that can already reproduce itself. The question dealt here is whether first life could have begun by chance or given the facts the probability is zero with a lot of zeros to hefty power after it!. So if there is a creator then there is no point discussing the idea of natural selection as the scriptures clearly say that God created all things according to their kind. Darwin did not attempt to answer this question of first life in his Origin of the Species. So there is no point arguing about this point as the evidence is in for creation as the most probable explanation for life on Earth. What might have subsequently happened after this fact is also an open and shut case. Findings around DNA and how it works completely precludes the idea of natural selection as a process where living things transform into other creatures no matter how much time or other factors are bearing on the species. Love to hear what else further you have to say in coming discussions around this subject. Don’t let me dissuade you from continuing to contribute. Have a nice day Appolos. Love to meet up for a beer one fine day. It’s important to understand where we agree and where we disagree. The latter may not even be the case because I haven’t argued against the probability that life came into existence by means of a creator. The evidence in that regard is indeed most compelling and I’ve never said anything to the contrary. It’s unfortunate that it’s even necessary, but I hereby reiterate my belief that life came into existence by means of God, and all the variety of life that we see is by means of God and the perfect processes he put in place. I called out the exact paragraph in which I think the article is problematic because I wanted to be specific about that. And you’re making my point in a way, because you’re automatically lumping my belief in natural selection with some belief that life arose by chance. Whereas I have stated my intention is to point out the error in combining those things, and the real dangers of confusing the issues when conversing with people on the subject. And I think that’s exactly what you are doing. Nice article Eric. I referred it to a regular poster on JWSurvey who goes by the psydonym outandabout. Always an interesting topic and a topic one will probably never solve to the satisfaction of all. My concern is far more related to the consequence of believing in a creator. Does this mean one MUST believe in the scriptures (all of them)? If one does not believe in a creator, then all rules come from men and that is it. You can agree, disagree, discuss and change those rules. But when on does believe in a creator, it seems such a person also must believe in a written document (Christian, Jewish, Buddhist, Islam etc). And in general these documents are considered holy and should be trusted to rule you. History has shown was this can bring to people. I guess the first thing is to establish which document is from God and which is from men. I know that men following “sacred writings” have brought much pain, but is it because the writings have directed them to, or because they have chosen to ignore those writings? In case you aren’t already familiar with his research, I’d also recommend the work of nanotechnologist Dr Jim Tour. His analyses of the putative mechanisms for abiogenesis are a veritable tour de force (pun intended). When you have a spare hour, sit back, grab some popcorn and enjoy watching chemical evolution dissolve into some primordial soup here. Thanks Vox Ratio, I’ll be sure to check it out. About the probability of proteins forming through chance: All the calculations are based on the premise that there were amino acids hanging around in a “prebiotic soup”, waiting to be assembled. However, there is no evidence that this was ever the case. The famed Miller Urey experiment used a hypothetical early atmosphere that is no longer considered to be realistic, and even then they had to use a trap door to preserve their results from dissolving. The likely composition of the early atmosphere is now thought to have been higher in oxygen, which would make it even more hostile to the formation of amino acids. Finally, a “prebiotic soup” would likely have left marks that a geologist could find, and yet such marks have never been found. So the probability calculations you cite are themselves based on a highly improbable (read: impossible) premise. If I’m understanding you correctly, you are saying that the math that Eric quoted is flawed from the get-go because the premise that it is based on is flawed, thereby rendering it useless? Sorry to take so long to respond, Warp, but I didn’t see this till now. Yes, that’s essentially what I’m saying. The prebiotic soup is just another sub-myth in the greater materialist OOL mythology. Nevertheless, one simple way to demonstrate the impossibility of abiogenesis is to demonstrate the probability calculations involved in the chance formation of proteins, since the variables are easy to manage. That’s undoubtedly why it’s used here. But I just wanted to point out that, in this approach, there’s an unspoken granting of the prebiotic soup premise for the sake of argument. Thank you for this article and the ones to follow. I personally need to have my faith restored, not that I ever believed or will ever believe in evolution as I have searched for God since I was 11 and for 45 years of my life thought I had found the “truth”! My awakening over the last 9 years has left me feeling completely lost and alienated from the creator and to some extent angry with Jehovah. I know I still have a hunger for truth and want to reconnect with my creator by the mere fact that I am a daily reader of this and other sites like it,seeking spiritual food and a way back so to speak. Being a PIMO makes it difficult I admit as I realize that I once would follow the GB no matter where they would lead me, (shame on me) and now I only look at them for who they truly are and do my best to unveil them to as many as possible before my final exit or more likely expulsion from the congregation. I have been successful with several friends so far and even though this has become my “new ministry “ I still feel I have totally lost my faith in Jehovah and Jesus and would like to get out of this limbo. Look forward to the next installment! Still suffering from Watchtower PTSD. I’ll make it a priority to get those articles out, GoGetter. I’ll add my thanks to gogetter’s. As I said in my email to you recently, I’m one of those who have struggled with questions about God after leaving JW .org. Your video has helped me greatly. I always clung to belief in a first cause, but was puzzled by the evidence of change in species over time and in isolation. Your statement that to you, this speaks of programming not chance, made a lot of sense. Thanks! As for the math… I don’t understand it but I do understand the improbability and the implications, which has restored my faith. I’m looking forward to your thoughts in future videos of the questions raised. I’m also going to look up those books you recommended. I’ve had a few of my atheist relatives recommending books that push evolution, ( taking advantage of my recent departure from religion! )so I’m happy to have recommendations from someone who shares my belief in God. Well done Eric keep up the good work. Hi Eric, wow! A very well formulated piece of excellent reasoning – a lot of thinking and work in what you present. Appreciate the references to further pursue this subject as well. And very well done, as usual. I agree totally in what you say about those who leave the Organisation Eric and it does sadden me greatly too. Unfortunately many allow themselves to come into another slavery of ideas that are equally based on erroneous foundations. Thinking that this will bring them the freedom and happiness they are seeking in life. I also have observed from scanning the internet and contacting personally some of these ones that they are equally unable to conclusively defend their new found belief system based on the available evidence as they could not when they were JWs. After a while sensing the lack of purpose in their life, the futility, and lack of satisfaction of such beliefs, they give up in believing in anything. And just live one day to the other without any moral compass, direction, hope or any real purpose in life. All as a result of subscribing to the ideas of Evolution and of the “New Age Atheists”. Behind this at the moment is the very aggressive and vocal “poster boys” that come to mind such as Sam Harris, Christopher Hitchens, Christopher Dawkins and Stephen Hawking. In addition to the basic theory of Evolution that Christians need to make a robust defence against, there is now also this “clever” new age philosophical attack from these very prominent atheists that are influencing many, (including many now vulnerable ex JWs) to the idea that there is no God based on pseudoscience and philosophical arguments. I am glad this platform is being used to address this attack on Christianity and the truth in general. Specifically on the topic, As said, science does not say anything ! Scientists do! The facts are and always have been there, they are discovered only. It is then up to the scientist to draw conclusions on their findings. Unfortunately many are dishonest with regards to what the facts reasonably point to, and allow their personal beliefs to colour the conclusions they come to. Christopher Dawkins in his book “The Blind Watchmaker”. Continually reminds the reader that despite the appearance of design in nature and what are forbidding astronomical odds that it may have come about by chance, one must continually remind oneself that this is not the case!! And that the correct and only conclusion is that it all came about by chance. Surely a case of science not saying anything rather of a scientist saying something. Something that is ridiculous given for example some of the information listed here in this very limited and short presentation!! 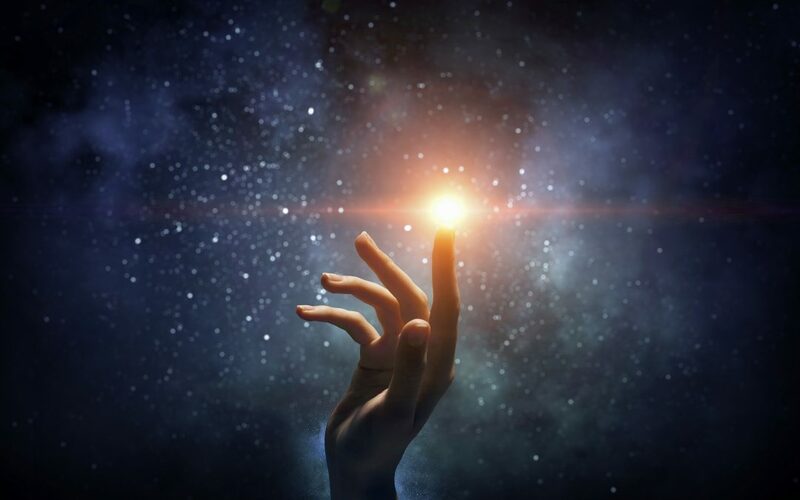 It’s only relatively recently that startling new information has been discovered that really presents the fact that the most reasonable conclusion about the beginnings of life point to an intelligent Designer Creator. In addition to the sources you site there is also a book called, Signature in the cell by Stephen C Meyer. This book is excellent in presenting the conclusions around the DNA in cells and the massive amount of information that is “written” in each and every cell that points to intentionality and design in nature. He too points out the astronomical numbers and the impossible amount of zeros that follow these numbers that this could have happened by chance! Factual information concluded by people who are not necessarily believers in God or the supernatural. But you also touched on why people, scientists included, resist the obvious. People are not prepared to follow the truth to where it logically leads too. Just like we did when we were in the Org. There are other powerful forces at work too that hinder people from coming to sound conclusions. Good work Eric looking forward to the next installment in this series.